Alex Guest: How can UX improvements encourage users to pivot from consuming to creating? This essay, which I have written with Marek Pawlowski, is the first in a series on the intersection between digital consumption and creativity. The original is at mobileuserexperience.com. To follow the forthcoming stream of articles, UI concepts and examples, track #uxintersection on Twitter, bookmark the 'Intersection' category at mobileuserexperience.com or sign-up for the weekly email newsletter. More importantly, this is an invitation for you to get involved in the discussion - we'd love to hear your feedback and ideas for taking this topic forward. Do you see yourself as a digital creator? Or more of a consumer? Most people will find themselves on a continuum, sometimes creating, now consuming. At times, the consumption of content - be it text, video, static image or audio - will directly prompt creativity. This 'moment of intersection', as we defined it, occurs when the consuming of content engenders creativity. It is not the inspiration itself - the instance of 'aha!' - but rather the decision to act upon it. The intersection is the fulcrum about which the individual pivots from consumer to creator, and allows for - and enables - the return to consumption. In discussion, we noticed how little had been said about the user experience of this intersection. Both 'Create' and 'Consume' have been individual themes at MEX but we wanted to go further and investigate the relationship between them. The motivations and the states of mind inherent in media consumption have been thoroughly explored, both at MEX and in other fora. At the March 2014 MEX, Alex facilitated a group to investigate user experience design principles to maintain focus during the consuming of digital media. A by-product of that exercise invoked some interesting modes of consumption, where the purpose of consuming was specifically to prepare for creating. While it remained tacit, the existence of the intersection was implicit: whether it leads to inspiration or is informed by it, media consumption will frequently result in various forms of creativity. Not quite as much is said, outside the worlds of art and of creative enterprises, about the creativity and the range of forms that it takes when 'ordinary' individuals turn their minds to producing new works. Nevertheless, it seems relatively well understood. Perhaps where there is a need for greater discussion is at the intersection - the transition zone - between the consumption of content and the subsequent creation of new forms. While the technological potential of mobile devices such as smartphones, tablets and wearables advances rapidly, their interaction models continue to favour passive consumption at the expense of nurturing users' creative impulses. We believe that the creative customer segment has been underserved, giving rise to an opportunity for media owners, device manufacturers, platform providers and software developers to win new users by improving the experience of transitioning between modes of consumption and creativity. In all cases, there is almost certainly sufficient capability to enable more frequent and more deliberate acts of creativity in response to consumed content. None of these seem examples seem like excessively strenuous activities, yet people who attempt them frequently will know that the user experience as it stands today can be convoluted and poorly designed. These methods of response have come into existence only in the past few years and some more traditional media companies have not have fully realised the myriad ways in which this creative loop could influence their content. User relevance. Addressing a common task already familiar to users rather than trying to project too far into the future. We chose the act of extracting and adding context to an image embedded in a news article. Technical viability. Referencing techniques available today, or in the near future, across a range of platforms. In this case, we took particular inspiration from the introduction of multi-window features in iOS 9, Windows 10 and future versions of Android. Fluidity. The transition from consumption to creativity should be seamless. 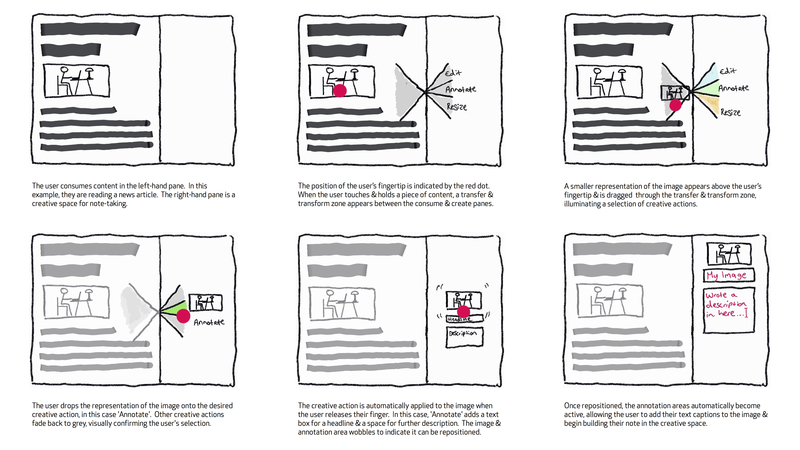 We try to show how a single touchscreen gesture can initiate and enrich the moment of intersection, thereby kickstarting the creative process. Which aspects do you find painful in your own experience of switching between consuming and creative digital media? How do you go about moving back and forth between the states of consuming and creating? What apps, tools and behaviours have you observed in other users?